The applications for the 2018 Henri La Fontaine Prize for Humanism are open with a deadline for application until 15 June. 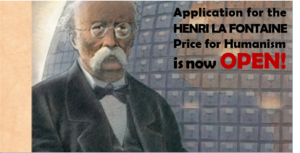 The Prize was created by the Foundation Henri La Fontaine in memory of Henri Lafontaine who received the Nobel Peace Prize in 1913. Henri Lafontaine was an international law expert who chose the path of pacifism as a vision of society. This led him to imagine and create the League of Nations, the organization to which the United Nations succeeded. To promote peace, he played an active role in the International Peace Bureau. As President, he effortlessly endeavoured to avoid the outbreak of WW1 (1914-1918). He later led a political career under the banner of socialism and promoted universal suffrage. He was also Vice-President of the Belgian Senate and engaged in movements promoting women emancipation. He published numerous articles and books on legal, political and literary issues. A hundred years later, his legacy remains essential and highly relevant. The eponym foundation’s Prize for Humanism aims at promoting individuals or organisations who defend his values. The jury will meet in July 2018 and the award ceremony will take place in October 2018. Rehabilitate those who refused to take part in the slaughter a 100 years ago! The 2017 Freedom of Thought Report is out!